I know this is from last week, but I had to wait to get my copy of M.O.D.O.K. : Reign Delay. It’s pretty good in that cartoony, funny book way. It speaks to the nerd angst/ impotence that is probably pretty common amongst the sort of people who might pick this book off the shelf. Ever wonder how this guy goes to the bathroom? Wonder no more! Be warned though, it ain’t pretty. I don’t know about you, but I’m waiting for the other shoe to drop after FF #571. You’ve got a secret consortium of Reed Richardses helping the multiverse with multiple Infinity Gauntlets, a basement full of lobotomized Dr. Dooms, and a guy with some of Doom’s DNA spliced into him. Surely something is going to go horribly wrong here shortly (I mean after the issues on the last page are resolved). The story still holds my attention with interesting ideas, but I could have done without the seemingly obligatory Reed and Sue arguement over how much time he spends in his lab. The art still bugs me. 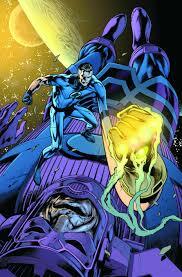 Over muscled is not a look for Reed Richards. Toward the end he also poorly channels Kirby in the face department. Jack Kirby was brilliant in a lot of ways. Faces were not an area of brilliance for The King. Everyone looks like Sue Storm, Professor X, or Darkseid; they just wear different wigs. Head shots of Johnny Storm, Warren Worthington III, and Steve Rogers would be indistinguishable. If you copy Kirby, copy the brilliance not the weakness. But I digress… Suffice it to say if you can get around the art, the story was solid. Your mileage may vary though. I’m not going to retread old ground talking about the Langridge Muppet book. Just accept the fact that it’s great and move on. Instead I’ll talk about this week’s other Muppet book. 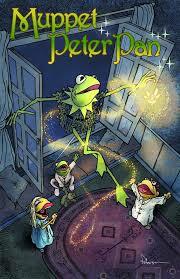 Muppet Peter Pan is starting off much better than its predecessor. It’s fast and funny. The book shows respect for the source material and the inserted Muppet characters.The art is also miles above and beyond here. I’m all for stylized looks and your own personal take, but last arc (Robin Hood) never stuck to the artist’s own model. In all fairness though, I’ve got a bit of a crush on writer Grace Randolph, but I promise that’s more a function of the smart writing and clear understanding of the Muppet voices… honestly. It has NOTHING to do with her silky blonde hair, her symmetrical face and features, pleasant contra alto voice, or her apparent wit, charm, and love of Muppets. Really…nothing to do with this review at all. Dixon’s GI Joe #9 is finally picking up some steam. The problem early on was that he had two or three plot threads going, but only focused on one per issue. Now he’s weaving them together better. It helps that the Mainframe/ Snake Eyes connection was explored and explained quite well in last weeks Origin issue. At this pace, we might actually see Cobra Commander sometime early next year. Dare we hope for issue 12 to be the culmination of this arc? That’s all I have to say about this week’s books. There were others, but nothing else good or bad. Good morning America. This entry was posted in Game Tape, Reviews and tagged Fantastic Four, Full Metal Destro, GI Joe, MODOK swirly, Muppets, The lovely Grace Randolph, The three faces of Jack Kirby. ← Iron Man … Secrets!